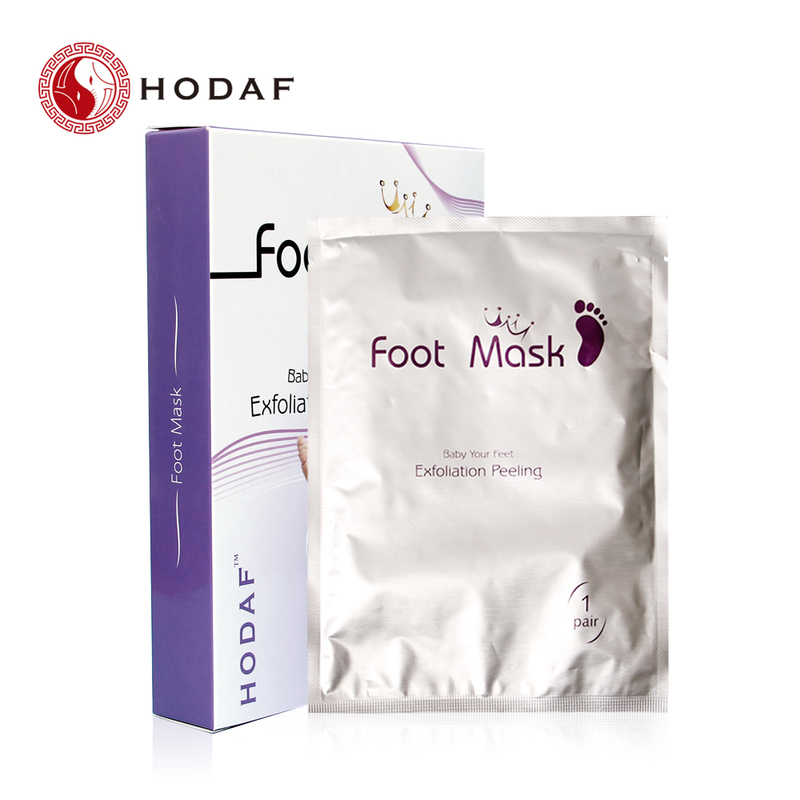 Did you ever heard about Exfoliating Foot Mask? 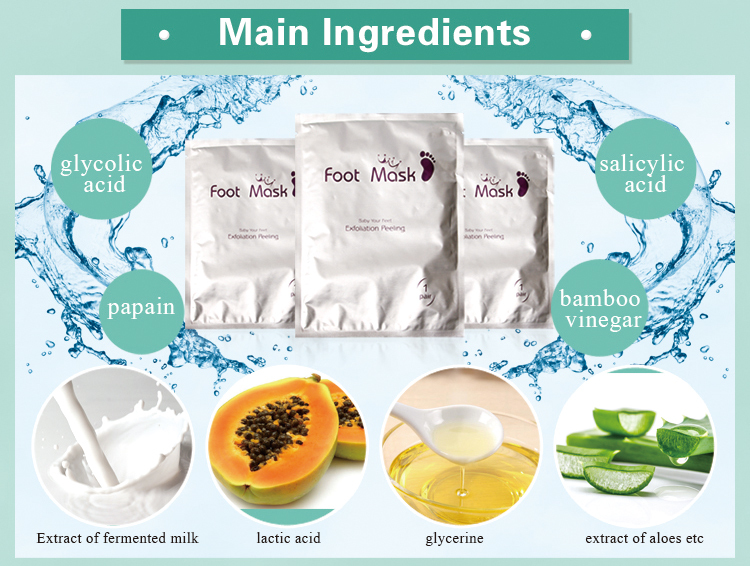 Do you know how does Exfoliating Foot Mask work? Included in each Exfoliating Foot Mask package is a pair of gel-filled plastic booties, which you put on your feet and leave for an hour. The gel is full of fruit acids, which penetrate the dry skin on your feet. A few days later, your feel will start to peel...and peel...and peel. You'll be amazed at how much skin peels off, but the process is entirely painless (although I'd recommend wearing socks as much as possible for a few weeks). After your skin is done peeling, you're left with, yep, baby soft feet. It's actually kind of amazing. Exfoliating Foot Mask aren't for everyone, but it is a good idea to add a foot mask of some sort to your winter beauty regimen to combat dry feet. In addition to Baby Foot, here are a handful of other hydrating foot mask favorites. 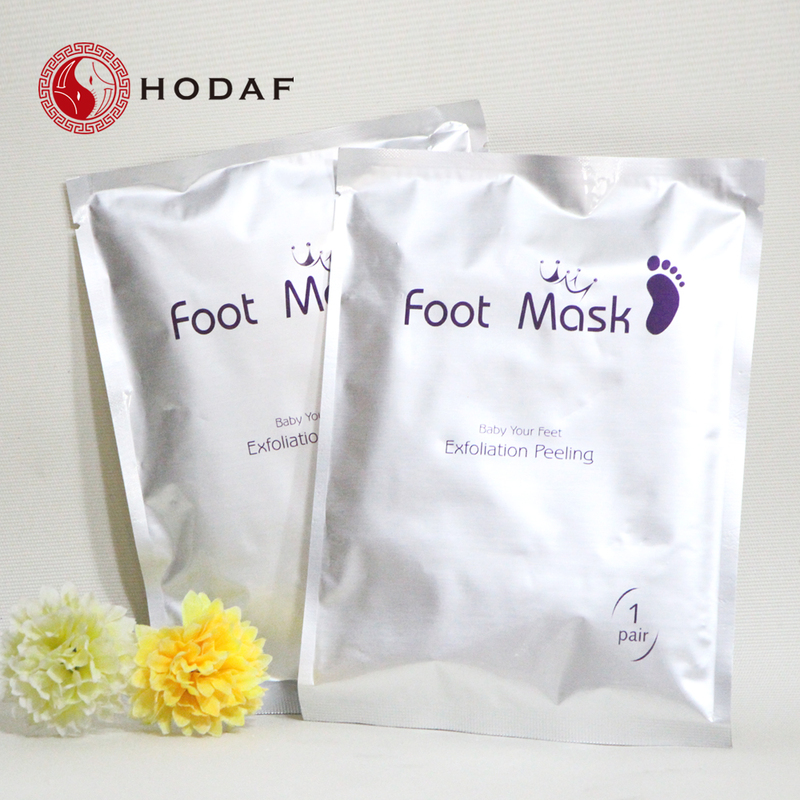 Our Foot Mask is an innovative foot care product that will make your feet as smooth and soft as a baby's foot. The unique formula natural extracts allow your feet to exfoliate naturally leaving them highly moisturized. it can remove the thick horny layers on the feet immediately to turn the foot skin delicate, tender and white; it can clear the bacteria on the feet and between toes at the same time. 1. Using scissors, cut the plastic sock along the indicated line. 2. Slip the plastic Foot Exfoliating Socks over your feet and close it with the adhesive strap to close it. 3. Keep the socks on for 60 minutes. 4. Rinse your feet. It is recommended to use foot Exfoliating Socks every 2-3 months to keep baby-soft feet. In some cases of hard skin, may not remove the desired amount of skin with one application. Could I know the moq for customized packing? If for private labeling boxes,the moq is 2000 boxes. 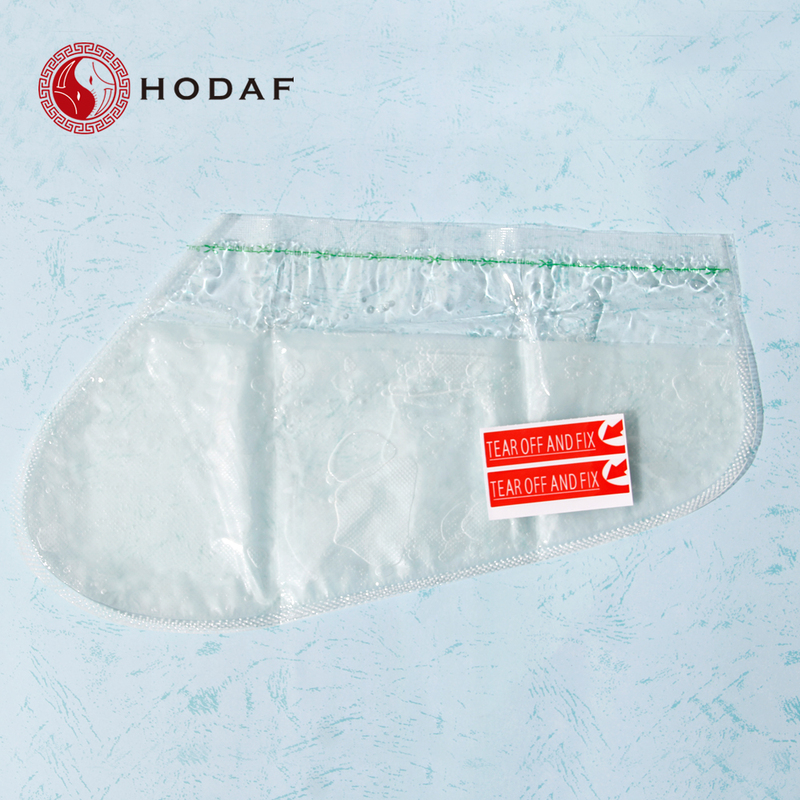 If for private labeling bags,the moq is at least 40000 bags. IF u think is too much,we also support charge customized deposit of 2000 boxes or 40000 bags ,then u can do small order quantities first , the balance will save by our factory ,after finished the 2000 boxes,we will transfer deposit to goods payment. 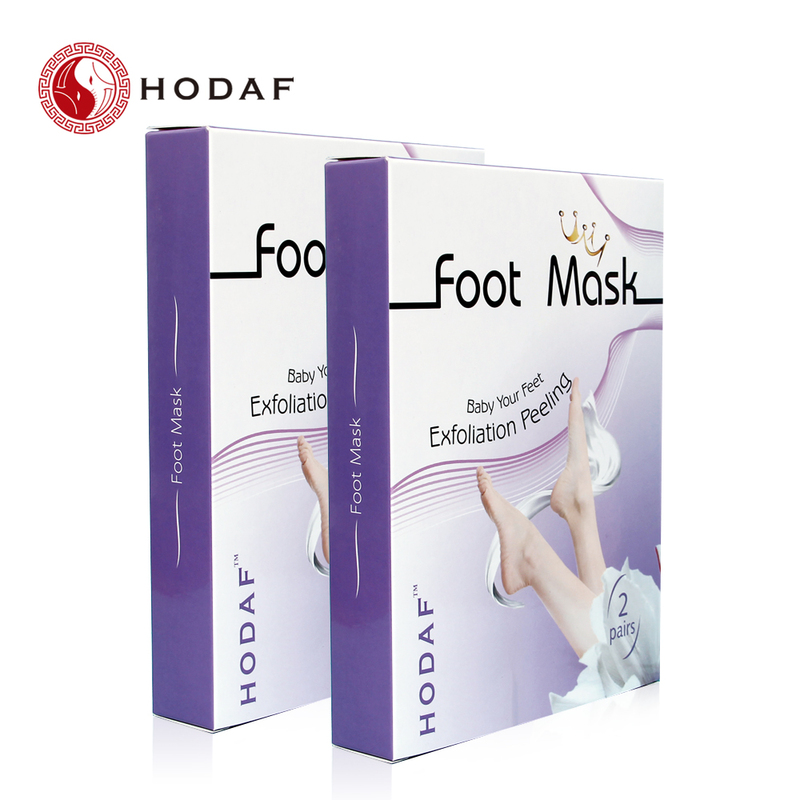 When can I see the result of the Foot Mask? It may take five to seven days, depending on the skin texture before exfoliating process starts. People with very thin skin will see the result faster and people with more callus build up may see the result later. What happens during the exfoliation process? During the exfoliation process, the dead layers of skin will become loose and fall off over time. This results in the shedding of the hard, dead skin on your feet. This can be compared to the peeling process of a snake, leaving behind its old, hard skin. 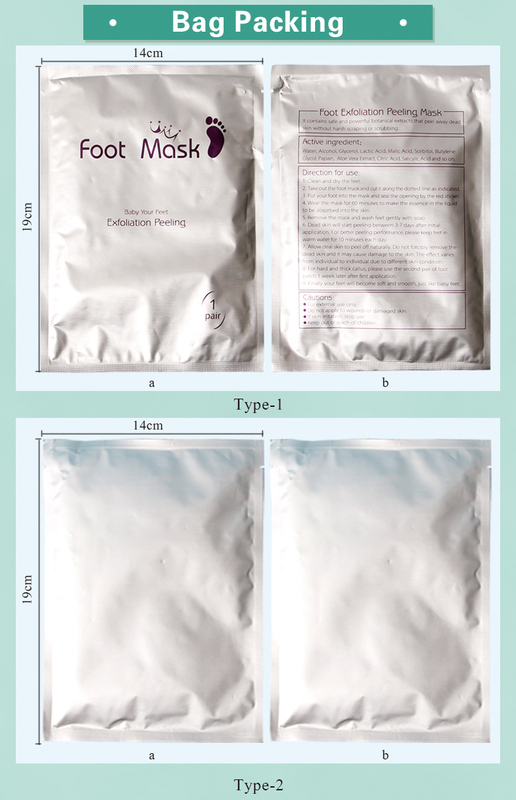 Looking for ideal Foot Care Pack Manufacturer & supplier ? We have a wide selection at great prices to help you get creative. All the Skin Care Products are quality guaranteed. 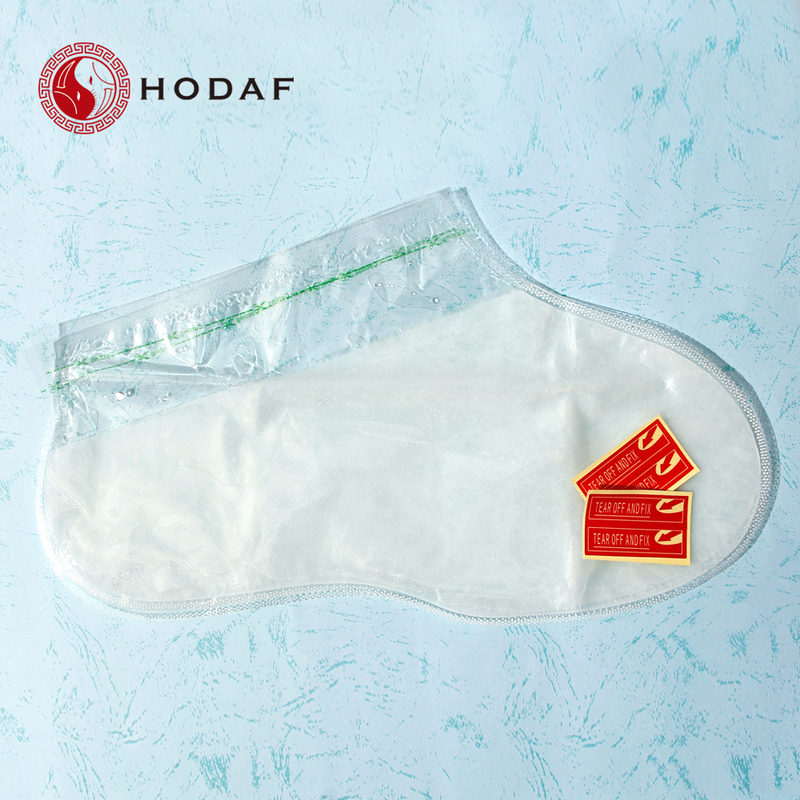 We are China Origin Factory of Foot Peel Spa Socks. If you have any question, please feel free to contact us.